Shred it, add it, and enjoy! Pancakes are popular all over the world—for good reason! They are super quick to whisk up and use just a handful of ordinary ingredients. Their versatility makes them a popular choice for any meal of the day. Enhanced with sweet or savory toppings, pancakes even make for a filling main. And what is best—they are a winner for all ages! With a very picky eater at home, I have been experimenting with different pancake alterations to make them more nutritious and introduce new flavors and ingredients. If shredded or puréed, then added to the pancake batter, even veggie-refusing toddlers will tuck in! Simply take a basic pancake batter recipe like this one. Drop the sugar altogether and use ordinary milk, if preferred. 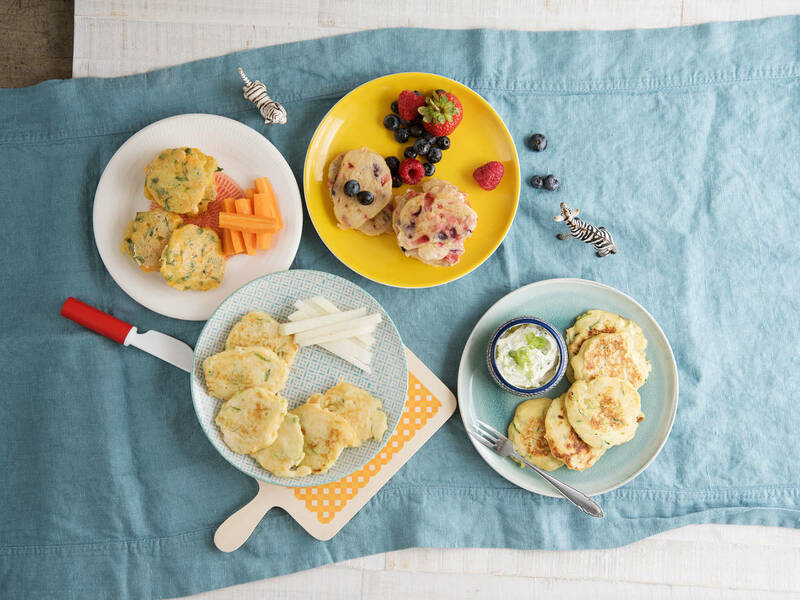 Then, add a handful of different vegetables or fruit (best shredded or puréed, depending on your kids’ preferences) to the pancake batter before frying, and be surprised! If you are new to experimenting with different types of pancakes, carrots are a safe vegetable to start. They are sweet and a popular side dish for most kids. Use a very fine grater to shred the carrots as thin as possible so that they cook through. Add some chopped coriander for further variation. The clue is in the title—sweet corn will add sweetness! Mashed avocado makes for a nice topping, or enhances the creamy texture of the pancake overall if added to the batter. If your kids spit out anything in small bits, simply purée the sweetcorn together with the avocado before adding to the batter. Similar to zucchini, kohlrabi won’t alter the pancakes’ color and taste. Add very finely sliced green onions for more bite. One of our seasonal favorites, pumpkin purée tastes wonderful within pancakes. Add pumpkin pie spice and maple syrup if your little ones have a sweet tooth. Sadly, wild garlic is only in season in spring. But it’s worth waiting for! As expected, wild garlic adds a subtle garlicky taste to the pancakes. Sweet potato or carrot mash work well as a topping. To make the pancakes, first chop the leaves, add them to the batter, and then purée for a very smooth consistency and delightful green color. If you are dying to try this outside of spring, or fancy serving green pancakes for Halloween, you can use spinach instead. Nuts like almonds don’t only add bite to the pancakes. They can also replace other ingredients for a more varied diet. Use almond flour instead of wheat flour, or almond milk instead of cow’s milk. Also perfect for people with gluten- or lactose-allergies. Traditionally in Germany, pancakes are served with apple sauce. Many schools and nurseries still serve them that way. If apple sauce isn’t at hand, or your child prefers dry pancakes without sauces or sides, simple chop an apple or grate it, then add it to the batter. A pinch of cinnamon adds a warm, wintery flavor. Any red berries, fresh or frozen, work well within pancakes. Blueberries whizz and explode when fried, which kids love. They make lovely pink and purple splotches, and taste sweet and juicy. What’s not to like? For more sweet variations that aren’t quite as moist, why not use some dried fruit? Raisins are an all-time favorite with most kids, but prunes, apricots, figs, dates, or cranberries also make for nice options. How do you like your pancakes? Comment below! Have you created the best pancake recipe of all times? Send it to community@kitchenstories.com and we’ll publish it on Kitchen Stories!